This past weekend was a little different for NASCAR as both the Sprint Cup and Nationwide series headed to road courses, Sonoma Raceway and Road America, respectively. To prepare, several of the Ford spent some time at Miller Motorsports Park to practice their road racing skills with Ford Mustang FR500S race cars. NASCAR regulars Ricky Stenhouse Jr, Trevor Bayne and Aric Almirola were joined by Billy Johnson, who normally pilots the No. 61 Roush Mustang Boss 302R in the Continental Tire Sports Car Championship. So did the road racing practice help? Perhaps not so much. Each of the NASCAR regulars finished between 20th and 30th, with Johnson finishing a strong 15th after leading for 10 laps in the Nationwide race. Regardless, it looks like the drivers had a blast driving the Mustangs at Miller Motorsports Park. You can check out the video from Ford Racing below. 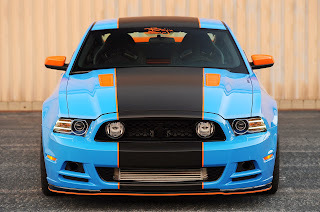 This entry was written by by MustangsDaily (Mustangs Daily) and posted here on Monday, June 24th, 2013 at 10:40 am and is filed under ford racing, miller motorsports park, nascar, Videos. This article was not written by us, rather gathered using RSS feeds listed here. We take no credit for this article. You can leave a response, or trackback from your own site.